First I'd like to declare that T claimed 'this is the best activity I've ever done' after he'd finished this one! 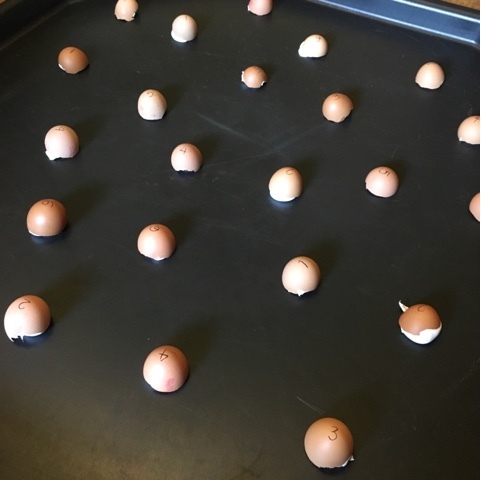 Although this was super simple to set up, it took some planning to save and wash the egg shells so not something you can just throw together one afternoon! We played it really simple rolling the dice and matching the numbers, although I've now found that T is capable of simple sums and so I could actually have done those instead, although I'm not sure he would have enjoyed it quite so much! 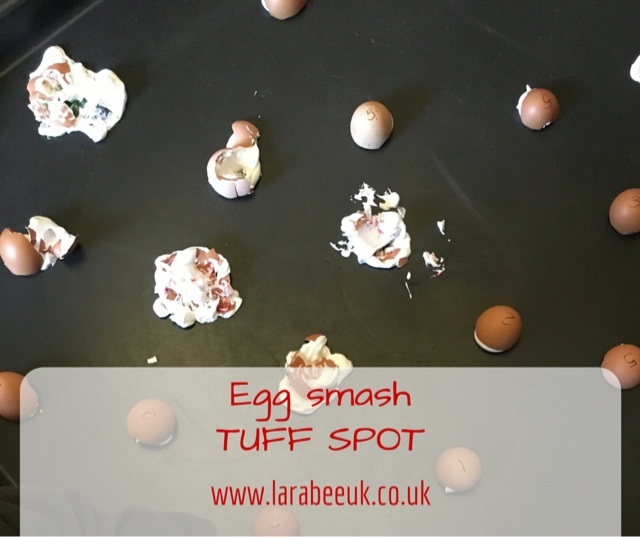 Tuff spot or something similar that will take a hammering! 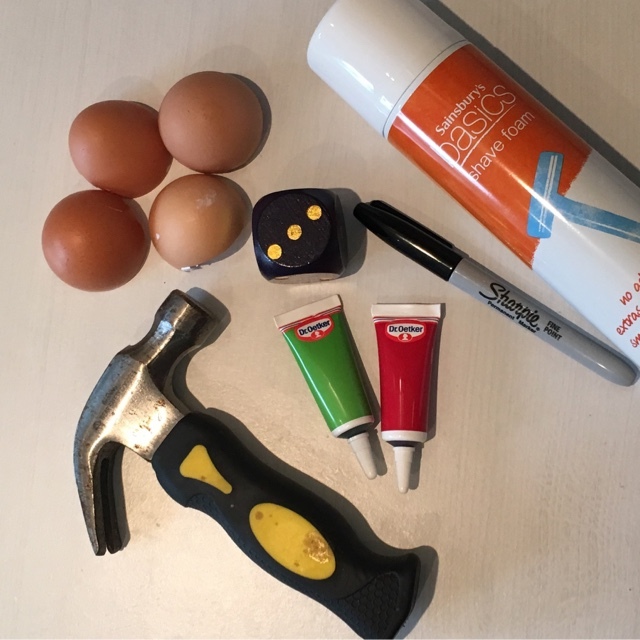 First I wrote the numbers onto each eggshell. 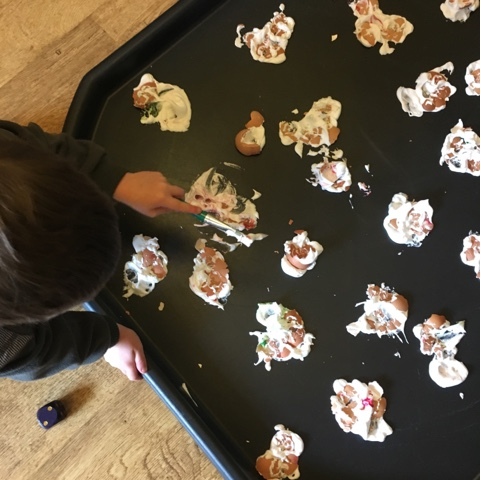 Then I filled each half, washed eggshell with shaving foam and placed them down on the tuff spot. I did add some food colouring to some, but it didn't work that well, if you do this is recommend stirring the colour through with a cocktail stick to mix it up first. 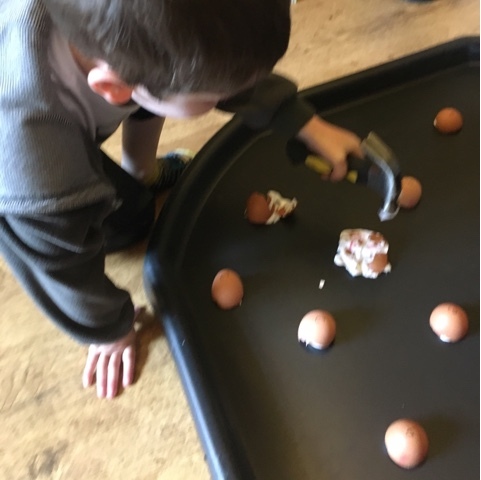 Our version of the game was simple, we took it in turns (or maybe we only took rolling the dice in turns ;) ) to roll the dice and then smash a corresponding egg, the winner being the last person to smash an egg. It did get a little harder towards the end when some numbers were all gone. This added to the game for T as he got more and more excited rolling the dice to see if it would come up with his desired number. 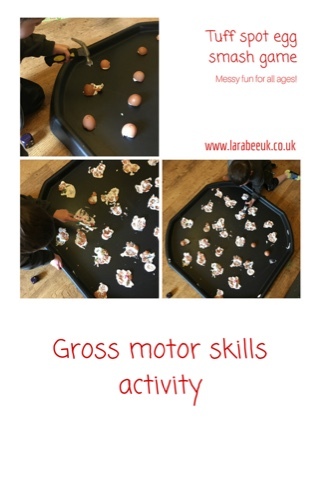 As I said, we kept this gross motor activity simple, but you could easily extend by using sums or discussing probability or even try being blindfolded! If you do give it a try, please do let me know, I'd love to hear how you got on! Brilliant activity! This looks like so much fun, what a fantastic idea! this is such a good idea - we don't eat many eggs here so I need to think of something else we could use... or perhaps make lots of cakes! wow that looks so much fun! For a moment I thought you were smashing real eggs I was like noo (I love eggs lol) but it's even cooler! !